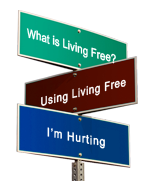 When life goes smoothly, when all seems right with the world, God’s faithfulness is rarely a concern. But in the midst of struggles and adversity, when the future looks unclear, or problems seem to defy resolution, we need assurance of His faithfulness. 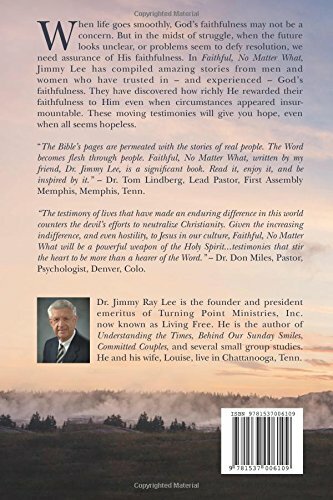 In "Faithful, No Matter What," Dr. Jimmy Lee has assembled a rich and varied collection of amazing stories from men and women who have trusted in – and experienced – God’s faithfulness. They also tell of how richly He rewarded their faithfulness to Him even when circumstances appeared insurmountable. Some of these stories are accounts of truly amazing, miraculous events, ones that cannot be explained other than through the eyes of faith and trust in a very personal, caring God. Others tell about how He has met very specific needs in timely and unusual ways, typically not too early but always just in the nick of time. Dire health problems, financial difficulties, family struggles, career decisions and other pressing life issues - all are addressed through these moving and inspiring stories from men and women who have discovered that God indeed is, "Faithful, No Matter What." Dr. Lee grew up the son of a pastor/evangelist. He experienced numerous occasions when God faithfully intervened to address crucial needs, even demonstrating that when we pray, "give us this day our daily bread," God takes that request literally and faithfully answers, often in ways beyond expectation. An ordained minister and ministry leader himself, Dr. Lee presents this book to all followers of Christ, especially those who every day must confront the challenges and uncertainties of working in vocational ministry. At times when strength is being sapped and hope is waning, the stories he has compiled will serve to offer reassurance and a reminder that when circumstances seem darkest, the light of Jesus Christ is ready to shine the brightest. 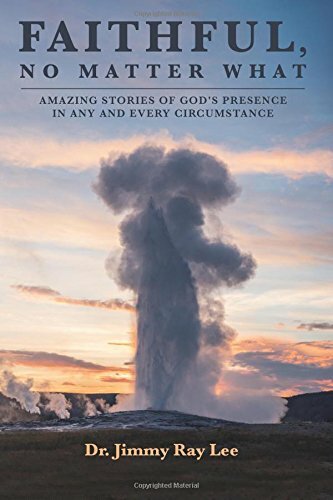 The book's cover image shows "Old Faithful," the famous geyser at Yellowstone Park that never fails. In an even more profound, life-changing way, God's faithfulness is a certainty. The powerful testimonies in this book will give the reader hope, even at those times when all seems hopeless.